When we planned to visit Brussels, our main goal was to visit the beautiful Christmas markets. 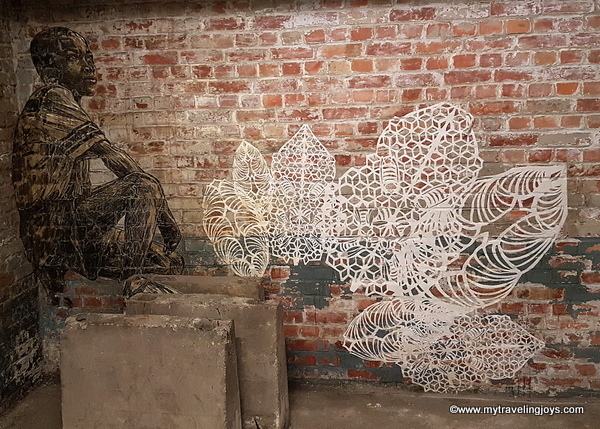 But along the way, we discovered some fabulous street art as well. Besides popping into numerous chocolate shops (Yum! 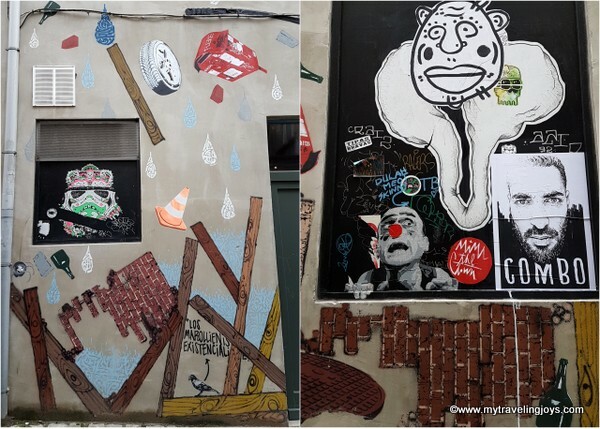 ), we wandered around many small side streets and found a city filled with fun, colorful cartoons and murals on many of its buildings. 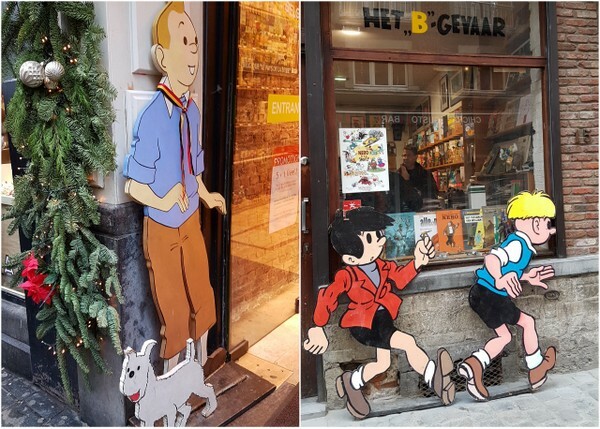 Before our trip, I had read that Brussels was known for its comic book characters such as Rin Tin Tin, but I still had no idea. 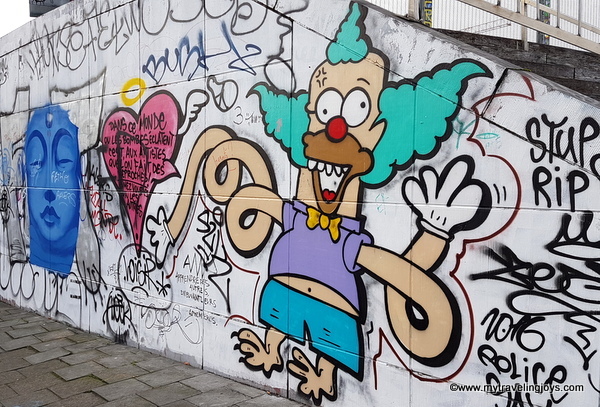 These delightful characters also play a major part in the city’s Comic Book Route, which features large murals paying homage to Belgian comic artists. 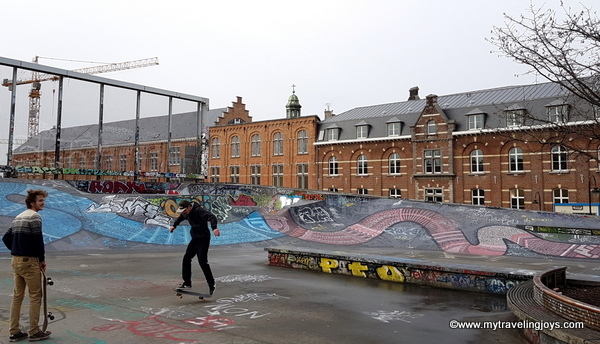 Let’s take a tour of Brussel’s street art scene! 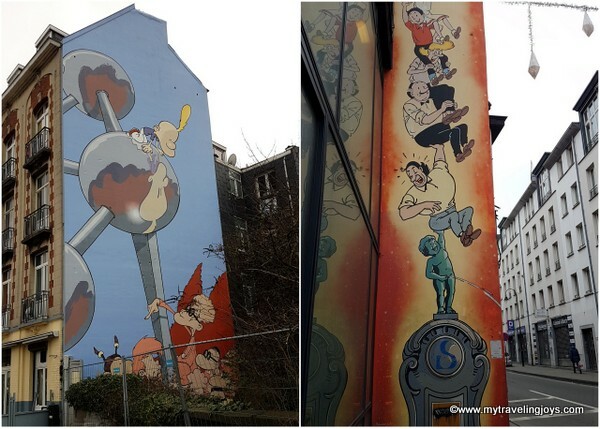 One of the most fun and unusual ways to explore Brussels is by taking the Comic Book Route. 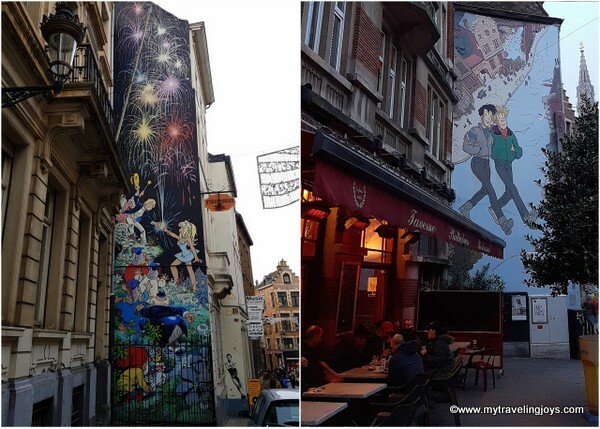 The project started in 1991 with the intention to embellish empty walls in the city, while paying tribute to famous Belgian comic artists. 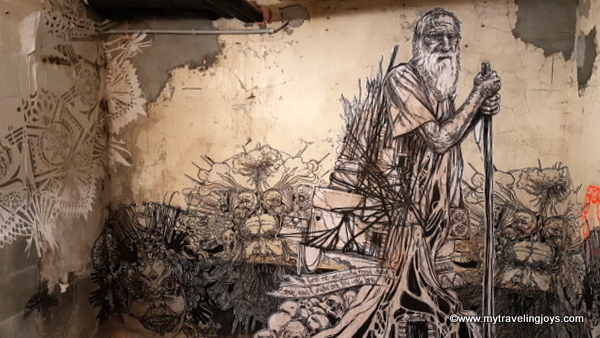 The route itself features over 50 mural paintings from iconic greats to lesser-known characters. You can find a map of the route here. The Broussaille Wall was the first comic strip mural to be painted in July 1991. The wall illustrates a cheerful couple, Broussaille and his girlfriend, going for a brisk walk around the city. Based on a comic series created by Frank Pé, the series was first published in 1978 in the local Spirou magazine. Not too far from the Broussaille Wall is the Victor Sackville Wall. 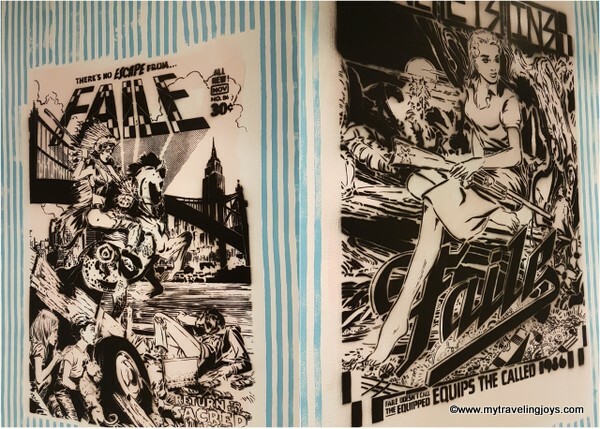 The scene on the wall comes from The Opera of Death, the first comic of the Code Zimmerman series created by Francis Carin in 1985. 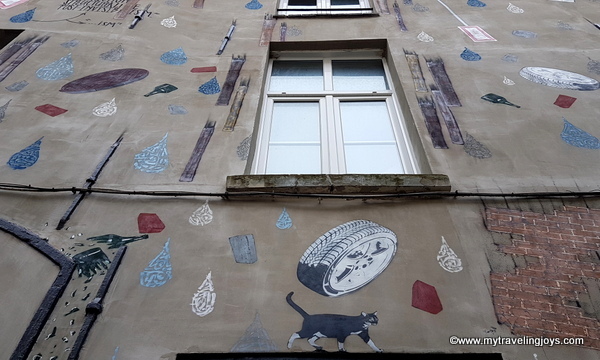 The mural depicts the main character Victor Sackville, a British spy that lands in Brussels, on the Rue du Marché au Charbon as it looked during WWI. 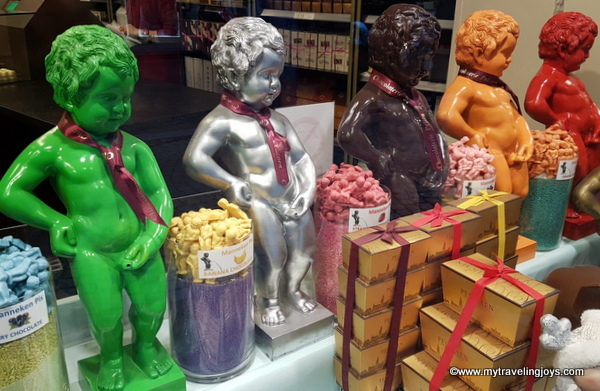 Without stopping peeing, the Manneken Pis, the famous symbol of Brussels, holds five of Belgium's best-known comic strip heroes in one hand. 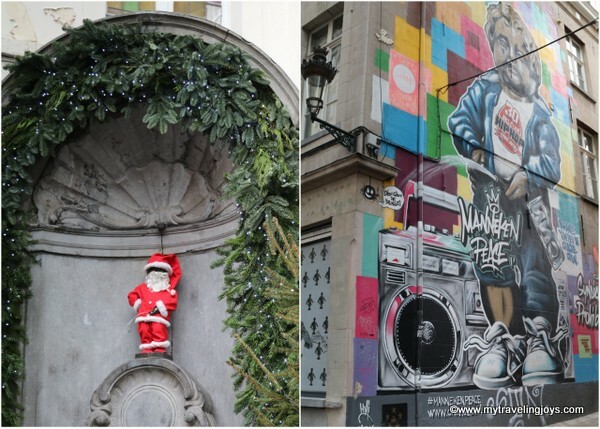 Be prepared to fight off hordes of tourists to see one of Brussel’s “little” attractions – the Manneken Pis (“little pee man” in Flemish). The peeing boy is a small, bronze, 17th-century fountain statue that measures just 61cm (24 inches). I'm not sure why everyone finds this statue endearing, but they do and he did look cute in his Christmas outfit. In fact, the statue even has an outfit for every season and national holiday. 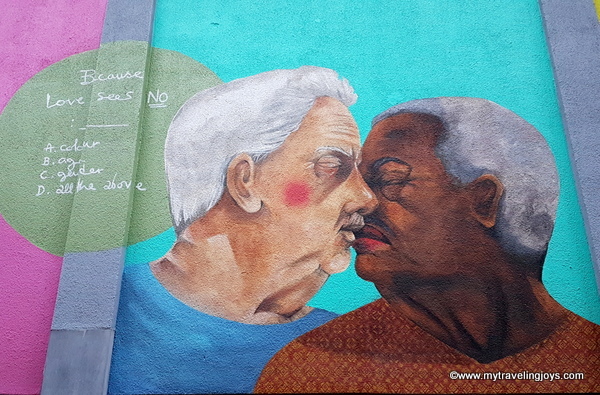 A nearby mural called Manneken Peace on Rue du Chêne was painted by artist HMI. He is a member of the Brussels CNN group, a famous group of Belgian hip-hop artists for the last 30 years. 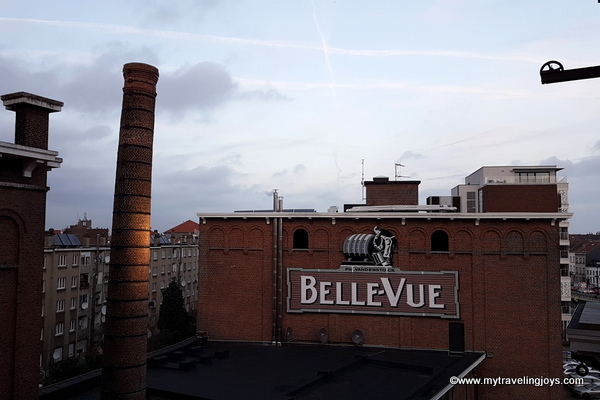 Located beside the canal in the center of Brussels, housed in the former brewery Belle-Vue, the MIMA or Millennium Iconoclast Museum of Art is an interesting visual arts museum. The MIMA presents temporary exhibitions, concerts and performances and has a permanent collection as well covering four different floors. 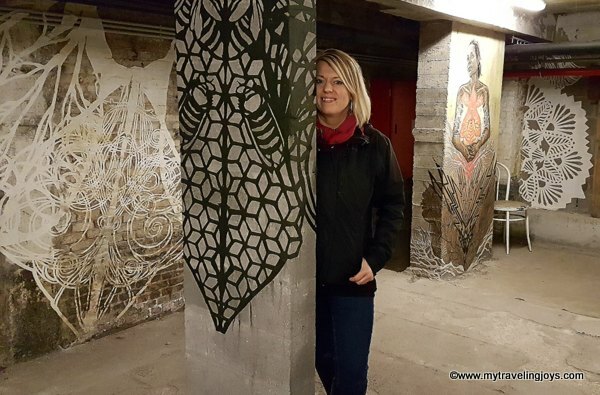 During our visit, the unfinished cellar looked like it belonged in an abandoned building – complete with crumbling walls and barren concrete floors but filled with amazing murals and paste up art. I was very impressed! 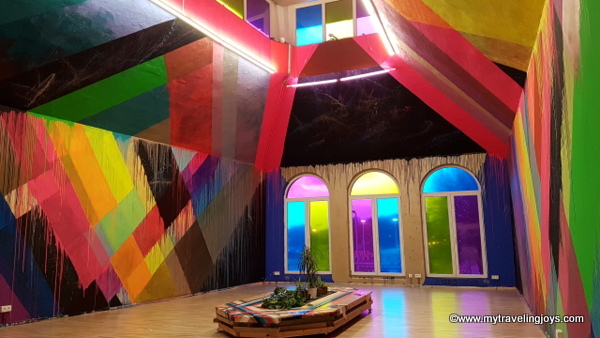 In 2016, American artist Maya Hayuk created “City of Lights” – a modern-like chapel with raised ceilings and stained-glass window treatments – a space for reflection. 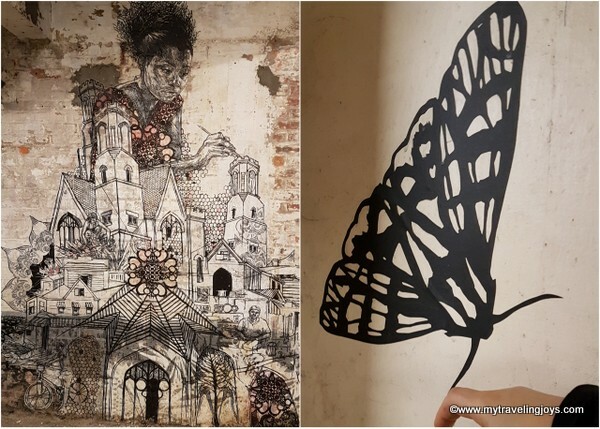 Here we found the walls on this narrow laneway completely covered in interesting street art and paste ups. 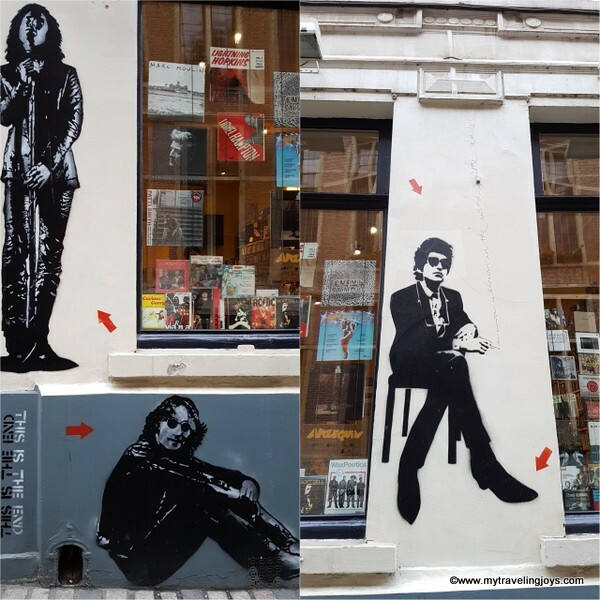 You can find life-sized stencils of Bruce Springsteen as well as John Lennon, Jim Morrison, Bob Dylan and Jimi Hendrix fittingly on the side of a second-hand record shop, The Collector, located at 7 Rue du Chên. 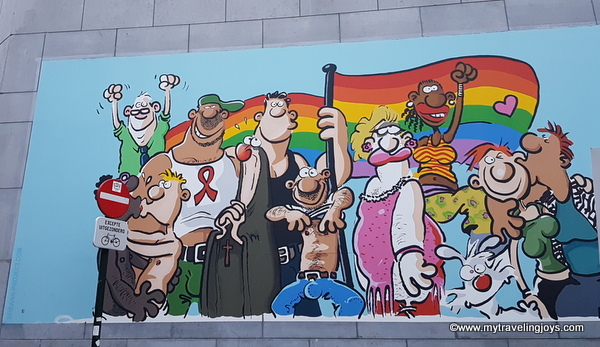 On a small street near the Mannekin Pis, Rue du Marché au Charbon, I believe, you will find an incredible colorful series of LGBTQ frescoes and several other pieces in Brussel’s gay quarter, which is in the same area. 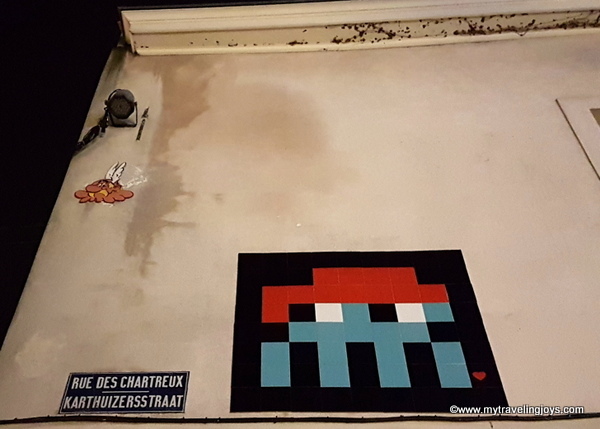 In previous blog posts, I’ve mentioned the French street artist known as Invader on our trip to Paris, but I didn’t realize that Brussels is home to about 40 of his mosaic installations. We found a couple of the tiled creations inspired from the 1970s-video game “Space Invaders” in the city center. Oh, I should also mention that one of the best ways to see more of Brussel’s street art is to hire a Villo! city bike. 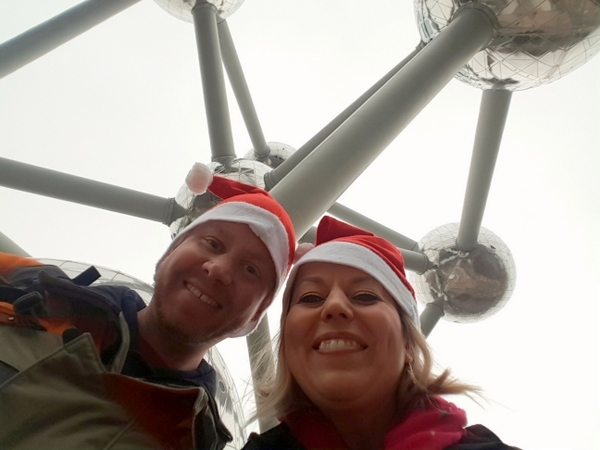 This gives you a chance to explore Atomium, a bizarre structure made up of nine metal spheres that represent an iron crystal magnified 165 billion times that was built for the first post-WWII world fair in 1958. Definitely worth the trek! 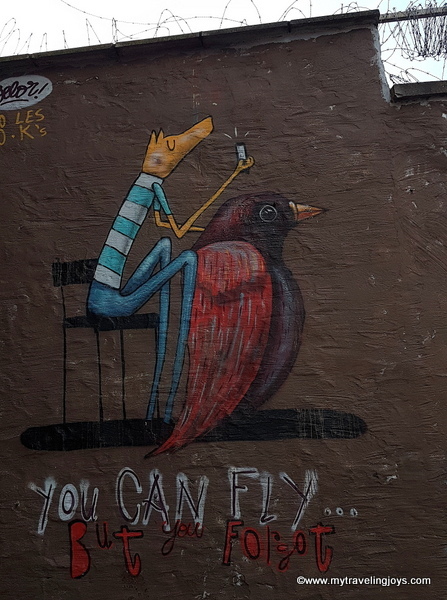 Love the quote in this mural in Brussels! Have you been to Brussels? 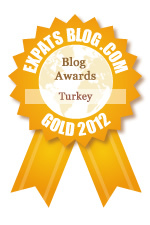 Any other travel tips for our next trip?